Do your employers want to evaluate your English language proficiency before considering you for the applied position? JobTestPrep will help you pass your language test with its high-quality PrepPack™ designed to improve your knowledge of the rules of grammar, spelling, and punctuation. Your vocabulary will also be enlarged with our practice resources. Prepare for your language test with our help and demonstrate to your recruiters that you have mastered grammar to perfection. Aware of the importance that companies attribute to their employees’ language proficiency, JobTestPrep has developed tests that will bring your knowledge of English language to new heights. We have collected in our exclusive PrepPack™ exercises that will sharpen your intuition of the rules of grammar: you will learn how to use tenses correctly and will unmistakably differentiate between the parts of speech and their roles in sentences. With our resources, you will also grasp the trickiest spelling rules so well that your orthography will become flawless. Your punctuation will become so too. Prepared by us, you will understand how to capitalize correctly and will always know where to put comma, semicolon, colon, or dashes. Learn standards of usage in the English language with our PrepPack™ and let your expertise in grammar lead you to a job offer. Knowing English grammar well and writing correctly are skills required in every job position. Employers make sure to hire only those people whose language competency is impeccable. If you feel that your knowledge of English grammar should be brushed up, study with our sophisticated resources. Practicing with our high-quality PrepPack™ will sharpen your understanding of the rules of grammar, orthography, capitalization, and punctuation. There are detailed study guides and answer keys added to our numerous tests that will make your learning process even more productive and enjoyable. With our resources, you will sail through your English Grammar Test easily and confidently. What Is Included in Our English Language PrepPack™? This test measures job candidates’ understanding of what words mean in given sentences, thereby checking not only their denotation, or their literal meaning found in the dictionary, but also their connotation, or associations and emotions connected to them. The methods used to estimate your vocabulary and comprehension of a written material are several. You may be asked to complete a given sentence according to its meaning and grammatical rules. To perform this task correctly, you will need to identify what an omitted word denotes, what part of speech it is, and what syntactic role it plays in the sentence. Misidentifying one of these grammatical definitions of the word will lead to an ungrammatically composed sentence and will reduce your score on the test. You may also be required to replace an underlined word in a sentence by another word that conveys a similar meaning. To perform this task correctly, you need not only to know what the word in question denotes in the dictionary but also understand the meaning of the sentence where it appears, because words offered as its substitution will not be its obvious synonyms. The words from which you will need to select its replacement will rather reflect particular nuances of the word’s meaning evoked in the sentence under discussion. Another task that you may be asked to do is to select a synonym to a highlighted word or a phrase. A synonym is a word or a phrase that means the same or nearly the same as another word or phrase in English. You will need to know the definition of the word in question, because it will not be given within a sentence. When the word is not given within context, you will not be helped by the sentence’s overall meaning and will not be able to make an intelligent guess and choose the right option. The fourth part of the Vocabulary Practice Test will require you to select an antonym to an underlined word. An antonym is a word opposite in meaning to another. Knowledge of the definition of the word in question is necessary, because you will not be aided by the context in which the word appears, since it will not be given as a part of the sentence. In general, you should possess large vocabulary to identify correctly the word whose meaning is opposite to that of the underlined word. On the Sentence and Paragraph Structure Test, some sentences and paragraphs are inserted into the text in wrong places, which causes its chronological and logical disorder. Applicants are expected to restore the order of the passage by putting misplaced sentences and paragraphs back they they belong. The test is divided into two parts. One requires job candidates to put sentences in order, another paragraphs. The tasks are usually accompanied by a list of possible locations where the sentence or paragraph can be inserted, from which you will need to choose one right option.To put a sentence into the right place in the passage, try, first, to analyze its meaning and its function. Read the paragraph through and determine whether the sentence under discussion logically follows the preceding one or whether it anticipates statements coming after it. You can also use the list of possible answers as a tip. Think over each suggested location and choose the most appropriate one. Paying close attention to pronouns, demonstrative pronouns, and articles in the marked sentence and in the sentences given in the list of answers may also help. Such demonstrative pronouns as “this,” “that,” “these,” or “those” always refer to specific antecedents and can give you a hint at the sentence’s place in the passage. Because sentences in the paragraph have logical and chronological progression, such adverbs as “next,” “last,” “then,” “before,” and “after” will also give you a clue to their right sequence. Such conjunctions and conjunctive adverbs as “but,” “yet,” “because,” “however,” “therefore,” and “although,” among others, may also help you identify the location of the sentence in question. To understand the sequence of paragraphs in the given text, pay close attention to the first and last sentences of each of them. A paragraph’s last sentence usually looks forward to the first sentence of a paragraph immediately following it. Concluding and opening sentences in two consecutive paragraphs may share verbal echoes or use the same words, or continue the development of the same ideas. If you notice that the transition from one paragraph to another is conspicuously discontinuous, then, perhaps, these paragraphs should not be placed together. Also remember that a well-written piece follows the rules of composition; that is, it has an introduction, middle, and conclusion. The well-written text also follows narrative, logical, and chronological progression. Read the whole given passage carefully and decide if it progresses smoothly and convincingly, and if its parts are connected harmoniously. By analyzing the text’s progression and paragraphs’ opening and concluding sentences, you will be able to see what paragraph is misplaced. This test is a reliable evaluation of your English proficiency. Tasks that you will be asked to perform will measure your knowledge of various aspects of English grammar. Some of the questions will estimate whether you can use tenses correctly. Expect to read sentences where the main verb is omitted. Having analyzed a sentence and understood its meaning, you will need to choose a verb in the right form and tense among several alternatives offered below the sentence. You may also be asked to select the right preposition, conjunction, pronoun, or morphological form of the word. Your knowledge of the rules of spelling may also be tested. To do so, the Grammar Practice Test will invite you to correct spelling mistakes made in certain words. But note that these orthographical mistakes will usually be made because of confusion between the parts of speech or morphological forms of a word and, thereby, will also indirectly aim to estimate your knowledge of English grammar. This test evaluates how well you know the rules of punctuation and whether you can capitalize words correctly. On the test, you will be invited to choose a sentence among four differently punctuated identical sentences. You need to tick off that sentence in which all punctuation marks appear in the right places. Sentences given on the test are usually compound; that is, they have more than one subject and predicate and thus require punctuation marks to be grammatically correct and understandable. You will need to know what punctuation marks are inserted between clauses in a sentence or before quotation marks, or indirect quotation. Your intuition of the rules of punctuation before and after conjunctive adverbs such as “however,” “indeed,” “moreover,” “nevertheless,” “likewise,” and “then” will be measured as well. Remember that if a conjunctive adverb joins two clauses together, then you divide them by a semicolon (;) and put a comma (,) after it. To pass the test with high scores, you will also need to know that restrictive modifying clauses are not set off by commas. Nonrestrictive clauses are set off by commas, because they add extra, nonessential information to a sentence. It is also advisable to revise the uses of a colon (:) and dash (-) before you take your English Language Test. Capitalization rules are less complex but also worthy of revision. 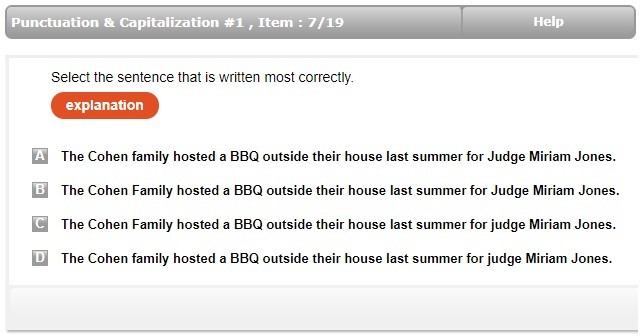 In the second part of the test, you will meet a list of four identical sentences with words differently capitalized. Your task is to choose one sentence with the right capitalization. Note that in addition to proper nouns and the pronoun “I,” the directions, historical periods, events, countries, languages, nationalities, and the first word in each line of poetry are started with letters in upper case. There are also other cases where capital letters in words may be required. Avail yourself of JobTestPrep’s thoughtfully designed practice materials that will tell you everything you need to know about the rules of capitalization. This test is a trusted evaluation of your ability to understand information given in a narrative test. On the examination, you will be presented with several narrative passages, which you will need to read attentively and quickly. Alongside these excerpts, you will see a list of questions, each of which will be followed by four or five answers. To answer a question about the information presented in the passage, you will need to choose one right response among wrong alternatives. Given passages will vary in subject matter. The text that you will read on your pre-employment examination may or may not be related to your profession or your future role in a company. The Reading Comprehension Test is strictly timed. You will usually be given less than one minute to answer each question, which is challenging. Try to scan questions before you start reading the text. Familiarizing yourself with questions in advance will help you focus on necessary information more quickly while you are reading the text. When Are English Language Tests Used? English aptitude tests are administered during the job application process, among other tests, depending on the skills required for your position and the job itself. These tests are used by various employers and educational institutions such as training and certification programs. They are particularly important in service positions or position requiring direct interaction with people. Candidates applying for roles in government may also be invited to take one of the English Language tests during their application process. These tests may also be used to measure language competence of job candidates vying for entry-level roles in big companies, or for admission to universities or other types of higher education. JobTestPrep can hone your understanding and use of the rules of English grammar. Our thoughtfully designed resources will help you pass your Grammar examination with high scores and, in doing so, land a job for which you applied.